The turnip is a bulbous root vegetable commonly grown in temperate climates across the world. Unfortunately it is unsuitable for cultivation in warmer climates as the hot temperatures cause the roots to become woody and unpalatable. While it is best known for its delicately mustard-flavoured roots the tender leaves may also be used as a winter green vegetable. In fact young shoots may be blanched and used as an alternative to sea kale. Luckily turnips can be harvested throughout most of the year so long as you plant a succession of the correct choice of varieties. 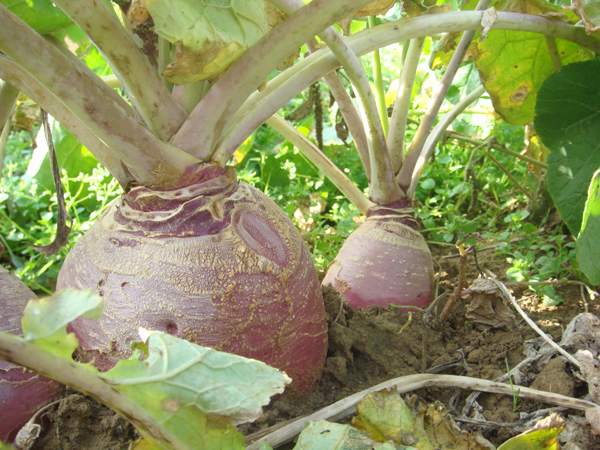 Turnips will perform best in a friable, light loam, but they can be grown in any fertile soil rich in phosphates. Prepare the ground before spring sowing by apply well-rotted farm manure or garden compost over the winter - being careful to dig it in deeply to prevent the roots from forking or producing an earthy flavour when cooked. Then give the ground a top dressing of lime at a rate of 7 oz per square yard on all but limy and chalky soils to reduce the incidence of brassica clubroot. Superphosphate and bone-meal are also valuable additions to the soil and should also be applied before sowing. If you have a south-facing plot then you can sow turnip seeds in the open in mid-March for an early crop. In colder, northern European regions you will need to protect the seedlings with a cloche against the worst of the cold, wet weather. Later sowings can be made in less sheltered positions. For harvesting during the summer sow turnip seeds in April and again in May, while an autumn and winter harvest you will need to sow in mid-July and late August. Sow the seeds 1/2 inch deep in drills drawn 12-15 inches apart. Once the seedlings have germinated they can be thinned out. Summer turnips will require approximately one plant for every 6-9 inches while autumn and winter turnips will need 12 inches between plants. Give the young plants a thorough watering once a week during prolonged periods of dry weather. Summer turnips can be lifted, even from when they are young, as and when they are required. 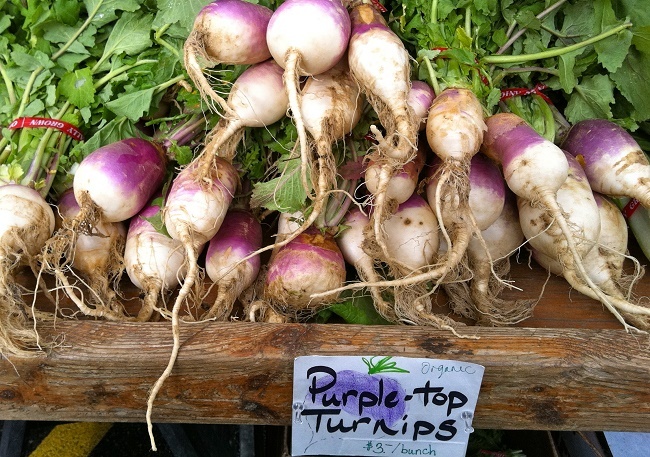 You can leave winter turnips in the ground and harvest them as needed or lift them all in November for storing. Remove all foliage before storing them in a clamp.